Combine rub ingredients in a small bowl and combine well. Press rub mixture evenly onto all surfaces of beef roast. Place roast, fat side up, on rack in shallow roasting pan. Insert ovenproof meat thermometer so tip is centered in thickest part of roast, not resting in fat. 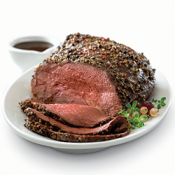 Roast in 350°F oven 1-1/4 to 1-3/4 hours for medium rare; 1-3/4 to 2-1/4 hours for medium doneness. 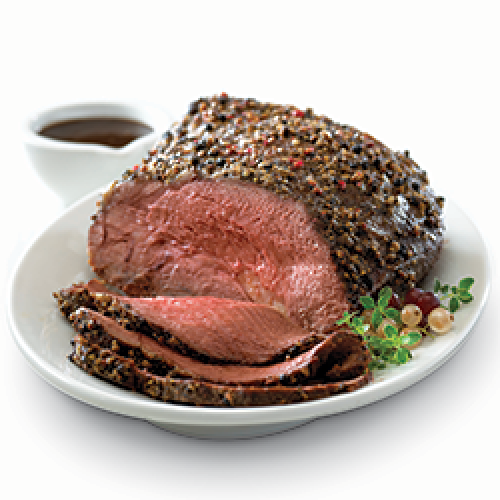 *Remove roast when meat thermometer registers 135°F for medium rare; 150°F for medium. Transfer roast to carving board; tent loosely with aluminum foil. Meanwhile, bring vinegar to a boil in small nonreactive saucepan i.e., not aluminum. Cook over medium heat 20 minutes or until reduced to 1/4 cup. Mix butter and flour in small bowl until smooth; set aside. Add broth, reserved drippings and pepper to saucepan. Gradually whisk in butter mixture until smooth. Reduce heat; simmer 1 minute, stirring constantly.